1/4 C Tofutti "Better Than Sour Cream"
Stir the "Better Than Sour Cream", brown sugar, lemon juice, and salt together until smooth. 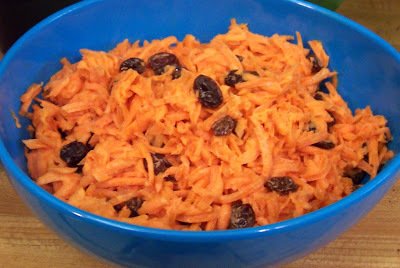 Toss with carrots and raisins. (If your raisins have dried out, plump them up by briefly microwaving in a small bowl of water.) Refrigerate or serve immediately. This recipe easily halves or doubles. Allow half a carrot per serving. here is another easy version. peel and grate carrots. take oranges and cut wedges into grated carrots( removing white part) add O J as you like. add raisins if you like. healthier, refreshing delicious.